The Premier League in 2011 might well be the Premier League with the strongest field of players ever. The 2011 participants are Phil Taylor, Raymond van Barneveld, James Wade, Adrian Lewis, Terry Jenkins Gary Anderson, Mark Webster and Simon Whitlock. In the first week Phil Taylor loses to world champion Lewis, but he does win his remaining thirteen matches and ends top of the league. Gary Anderson also quickly secures a spot in the top four. The battle for the remaining two spots remains exciting until the last weeks. Eventually, Raymond van Barneveld secures second place in the overall standings and Lewis takes the fourth and final spot. Mark Webster makes a strong start to the 2011 Premier League, but halfway through he has to swallow eight league defeats in a row, partly because of those defeats he finishes last. James Wade begins very moderately by gathering four points in eight weeks, but in the end he is still very close to qualifying. Unfortunately for him, his top form kicks in just a little too late. In the play-offs Adrian Lewis very surprising beats Phil Taylor in the first semi-final. The Power misses the final of the Premier League only for the second time in history. In the other semi-final Gary Anderson comes from behind to beat Van Barneveld. In the final he is too strong for Adrian Lewis, who seems to have shot all his bullets in the semi-finals. 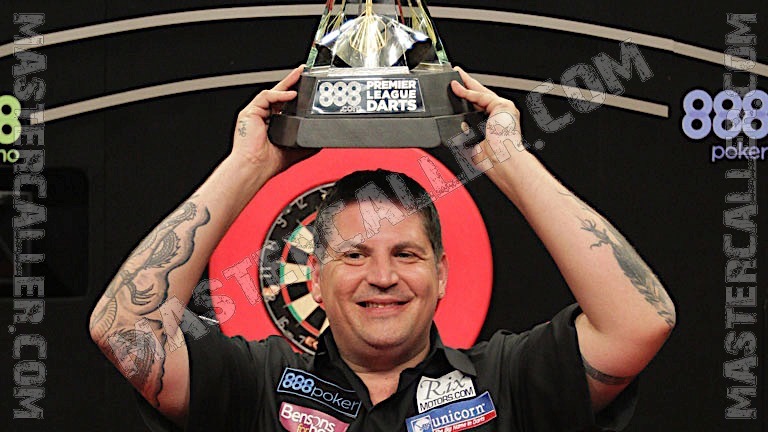 Gary Anderson becomes the first Scot to win the Premier League.